And speaking of food, celosia (which belongs in the amaranth family) is quite edible and grows across Central and West Africa, and is one of the leading leafy green vegetables in Nigeria, where it is known as ‘soko yokoto’, meaning "make husbands fat and happy." That's straight from the internet, because i couldn't make that up. Also we just posted the results from our last two peony classes. Saw I Am Love last night. One of the most beautiful movies - Tilda Swinton is a goddess onscreen and the guy who plays Edo isn't so bad either. 1. i want to rub my face in that cockscomb. i guess that puts me in the like camp. and i'm not trying to sound dirty. 2. i've never knowingly eaten a sardine. 3. i went to see exit through the gift shop where i saw a preview for i am love and can't wait to see it. was breathless just watching the preview. Love cockscomb. It reminds me of coral reefs. I had a good meal at Seersucker. It's pretty cleaned up for Southern food, but tasty. PS: Ft. Defiance does make a better deviled egg. As do I. And mine are much cheaper! I thought "I Am Love" was one of the most beautiful movies I have ever seen, too! Edo was dreamy as was the luscious landscape and food. Plus that typography!!! My friend and I couldn't bring ourselves to exit the theater after. i enjoyed seersucker quite a bit. 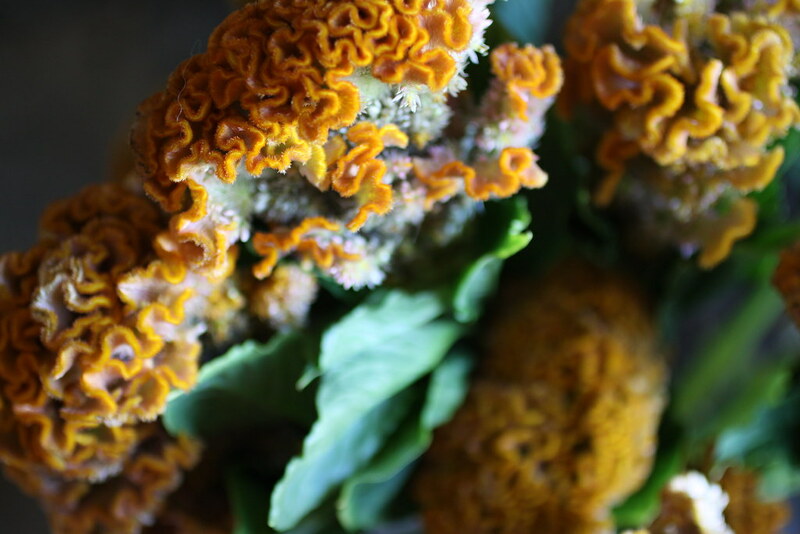 I like Celosia b/c it sorta looks like food-dyed brains. Didn't see I Am Love, but you had me at Tilda Swinton. Check her out in Orlando (1992-ish) if you get the chance. but yes, the color on those flowers is amazing. i love this blog. cockscomb. be still my heart. Exit Through the Gift Shop is a movie I've been meaning to recommend to you....via Sue J.
what else do people seriously love/hate? it's so interesting to me that individuals dislike flowers of any persuasion. everything has a time + place. like licorice. like cilantro. sardines...? 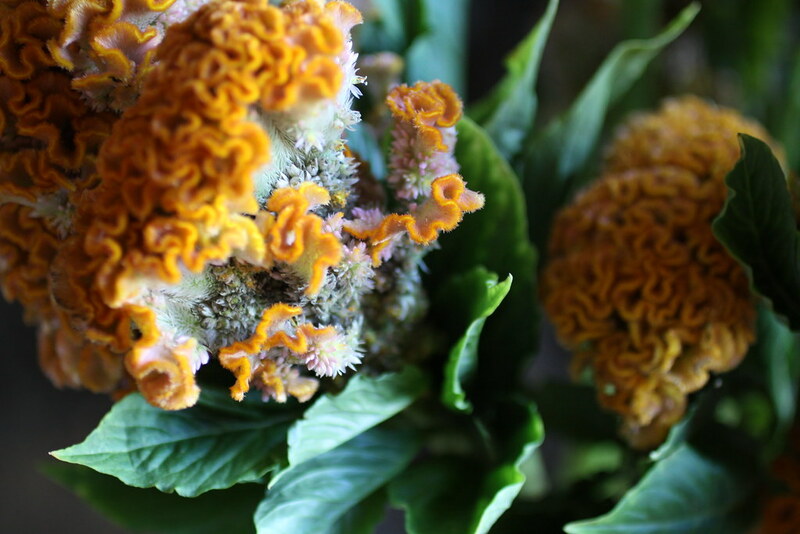 I love Celosia and I did not know it was edible. I have been growing some in my own backyard and using it periodically in bouquets. It's a very prolific plant. Love cockscomb! Especially in that deep red color they come in. But I never knew it was edible. My grandmother grows tons of it. I'll have to tell her she can eat it!! I love cockscomb! How do you cook with it? Is it like nasturtium? I Am Love was amazing...I saw it alone and at that part where you know what happened by the pool I gasped loudly and clutched my mouth. Needless to say the entire movie theater turned around. and fort defiance makes the meanest tom collins hands down wham bam thank you maam! Oh cockscomb. How I miss having my very own flower shop! Love the cockscomb (no way to say that without making a double entendre). I didn't know it was edible so thanks for the info. Right now my lavender is blooming and I'm eating it with everything :) Favorite way? Sprinkled on Greek yogurt with honey and cinnamon.